This evening I was in the mood to have squash casserole with dinner. The recipe I typically use has crushed Ritz crackers in it...so I decided to see if I could modify it a bit and substitute almond flour for the cracker crumbs -- I made a few additional modifications as well. It turned out absolutely delicious with a "souffle-like" texture. 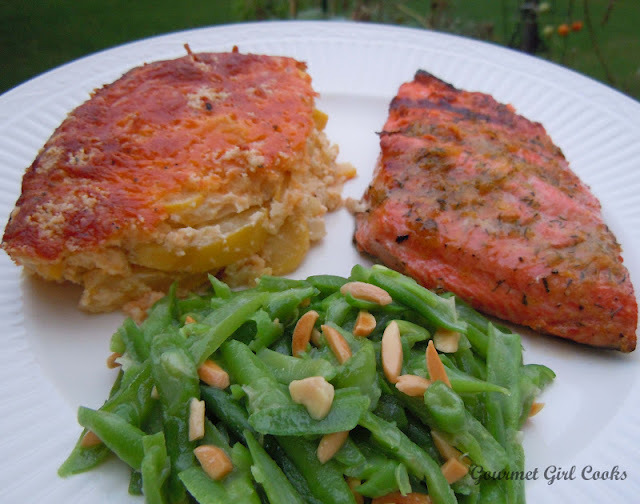 For dinner we had grilled Lemon Dill Marinated Wild Salmon served with Yellow Cheddar Squash Casserole and Green Beans w/ Almonds. Below, you will find a few pics that I snapped as well as the recipe I concocted as I went along. 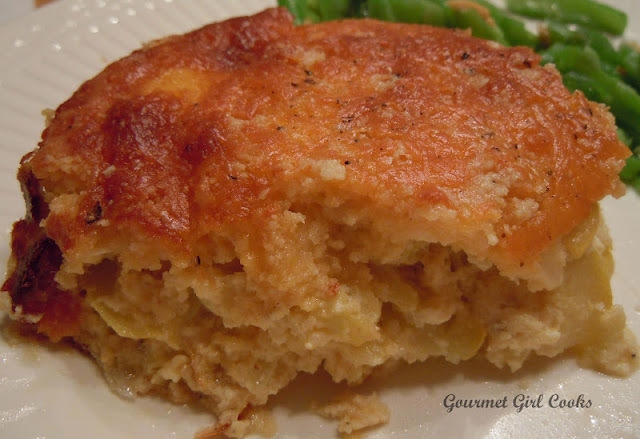 You'll find the recipe for the squash casserole below. Enjoy! In a small bowl, mix 1-1/2 cups shredded cheddar cheese with 1/2 cup almond flour; toss with fork until well mixed. Add the almond flour/cheese mixture to the bowl of squash; toss and combine well. Pour beaten egg and milk mixture into the squash mixture and combine well. In a separate small bowl, place remaining 1/2 cup of almond flour and remaining 1 tablespoon of butter. Cut butter into the almond flour (like you do when you make the topping for a fruit crisp). 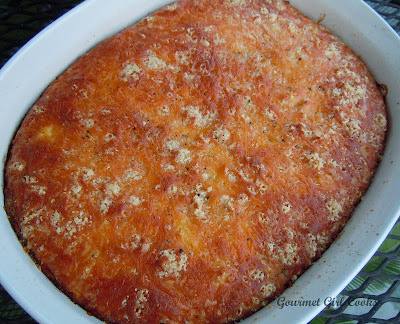 Once butter is cut in and the mixture is crumbly, add remaining 1/2 cup of cheddar cheese and toss well. Pour squash mixture into a lightly greased baking or casserole dish; top with the almond flour/butter/cheddar mixture and sprinkle with black pepper, if desired. Bake in a 375 degree oven for approximately 35 minutes, or until golden brown and done. *Note: You can add more cheese to the casserole if you like. Most squash casseroles use 1 to 1-1/2 cups of milk along with the egg mixture. I reduced the liquid to 1/4 cup of half-n-half since the almond flour doesn't absorb as much as the usual "52 Ritz crackers" that would be in the original recipe. This looks delicious and squash is pretty cheap right now - I'm going to try this tomorrow night! Thanks for the recipe. Your recipes are delicious and they have helped me and inspired me to cook wheat free. Thanks for sharing and perfecting the recipes! Pictures are always besutiful. From someone who likes to cook but is trying to relearn to cook without using the wheat products. I made this for my family last night, and it received RAVE reviews all around! We nearly had to have an arm-wrestling tournament to decide who got the leftovers for their lunches today. :) This one's going into our regular side dish rotation. It's excellent! And you're really helping me gradually, painlessly move them toward a wheat-free diet. We still have some who won't let go, but recipes like this REALLY help me make my point! Thanks! This was absoulutely delicious! Living in Louisiana,we like our food a little spicier than many, so I replaced the salt, pepper, and Cayenne with my favorite Cajun Seasoning. I'll use more next time, but it was spectacular! So nice to finally find a GF dish that didn't involve rice or processed garbage. I made this for our lunch today and had to come back and compliment this awesome dish. As is per usual for me, I didn't have every single ingredient that the recipe called for. This time, I was surprised to find that it was almond flour I was low on. But I had coconut flour. So for the half of the called for flour in the squash part of the recipe I subbed coconut flour and it was just great. I knew that in the past that this recipe could be kind of wet. And coconut flour would actually help with that issue. Then I used my remaining almond flour in the topping and thought that it was perfect there. I may rewrite my version of the recipe so I don't forget I made this deviation and that it worked. Made this again last night. This is one of my all time favorite sides! I just found this tasty recipe yesterday and made it today. I especially like the fact that it not only tastes delicious, but it is diabetic friendly. Thank you for sharing this recipe. I've made this several times and loved it. Now I'm wondering if it could be frozen and baked later? Good idea, thanks, I will try!